Smart solutions, easy communication. Keep your team connected when it matters most. Around the globe, and from factory floors to construction sites, noise hazards are a real challenge. Your hearing is precious and fragile; damage your hearing and life may never sound the same. If you were to lose your hearing tomorrow, what sounds would you miss the most? Family conversations at dinner time? The sound of your child’s laughter? The sound of your favourite song? We all have emotional ties to what we hear, and love hearing the things that make us happy. That’s why it’s so important to pay attention to noise levels that could rob you of savouring the sweet sounds you enjoy — protect your hearing so you can enjoy the sounds you love. Noisy workplaces provide many challenges for workers, with two of the main issues being health and safety. One health issue is hearing loss. One in six Australians are affected by hearing loss to varying degrees — a figure that is expected to rise to one in four as the country’s population ages. When it comes to the workplace, there are a number of regulations that must be adhered to by employers and employees in order to lessen the impact the high decibel environments have on an individual’s hearing. Prolonged exposure to noise in the workplace can result in noise-induced hearing loss. Exactly what is noise-induced hearing loss (NIHL)? In layman’s terms, NIHL is a hearing impairment resulting from exposure to loud sounds. Noise-induced hearing loss can be caused by a one-time exposure to an intense impulse sound or by prolonged exposure to noises over 85 decibels. While one-time exposure to a loud impulse sound may damage your hearing and cause tinnitus (a ringing in your ear), continuous exposure to loud sounds causes a gradual loss of hearing over time. When we think about NIHL we typically associate it with the workplace, however, it is more than just a workplace issue. It’s not just power tools and industrial machinery that can damage your ears. Any sound, whether it’s music, cheering crowds at a sporting event, cars roaring by at the race track or the blast of a rifle, can all be hazardous. Any loud sound can damage your hearing. “Deafness is one of the most common disabilities worldwide. One in six Australians has some form of hearing impairment — that’s 3.55 million people. The number of Australians with deafness is expected to increase to one in four by 2050.” — Source: Deafness Forum Australia, Fact Sheet — Protect Your Hearing. Are you one of the thousands of workers who are employed in a hazardous noise environment and potentially exposed to hearing hazards every day? Clear communication is key to helping keep work teams safe and productive, especially when they’re working in loud environments or with heavy machinery. Not only do they pose the threat of hearing damage, but they make it hard for teams to stay aware and stay connected. When your team can hear more clearly and stay more closely connected, they’ll be as powerful and efficient as the machines they operate. At 3M, we help workers hear what they need to with a spectrum of communication solutions designed with safety in mind. Comfort is key too. That’s why we design products for all-day, everyday use, so your team can focus on the tasks at hand. And with advanced noise-cancelling headsets and microphones, we can help ensure they stay connected even in loud environments. Protects the wearer from high noise environments whilst allowing them to communicate. This can improve productivity, prevent workers from feeling isolated and allow them to hear important warning signals and alarms without the need to remove their hearing protection. Protect your ears, protect your profits. You can’t afford to stand around talking — or worse yet, jogging away to a quiet location. 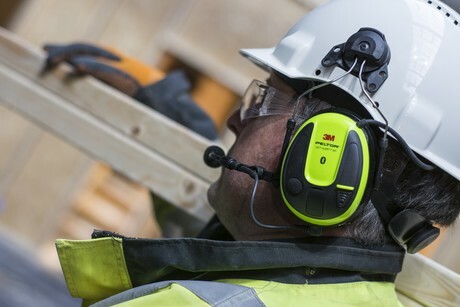 Think how much more productive you could be with the new 3M PELTOR WS ALERT XPI Hearing Protection Headset. Turn your hearing protection into a communications centre. Connect one or two devices via Bluetooth MultiPoint Technology and converse in normal volume even in noisy environments with the noise-cancelling microphone. Contact a 3M Safety Specialist for more information or visit our Centre for Hearing Conservation. What options do managers have for protecting their workers from heat-related illnesses?